Called the old Idaho state penitentiary due to its outdated design and from being replaced by more modern facilities. 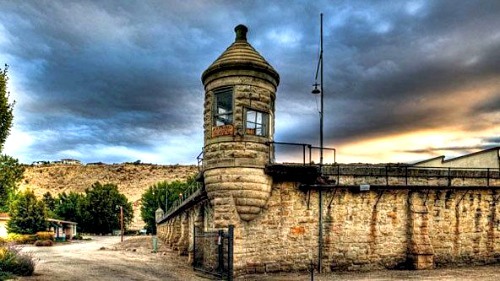 The first part of the prison was built in 1870, it consisted of a single cell house and was known as the territorial prison for the area of Idaho, since it hadn't been granted statehood yet. Though it began small the prison would quickly expand and only 2 years later in 1872 it became the primary prison for the territory of Idaho. It is surrounded by a 17 foot high sandstone wall which was quarried by the prisoners themselves from the nearby ridges. The inmates are also responsible for construction of many parts of the prison. In its time of operation it processed over 13,000 inmates, though it only had a capacity of 600 which was often exceeded. During the later years of its life the prison suffered from outdated workings and poor conditions for the inmates, which resulted in 2 major riots breaking out in 1971 and 1973. The riots claimed a number of lives and damaged several of the prison buildings, which led the state to move over 400 of the inmates to another prison. It closed down at the end of 1973 on December 3rd as it seemed not practical to maintain such an outdated facility. In the year of its closing the prison was put on the "National Register of Historic Places" and today is open to the public as a museum and also has been known to hold ghost tours. Is the Old Idaho State Penitentiary Haunted? Most of these old prisons seem to be haunted, and rightly so since they are places of sadness and torment. The old Idaho state prison is no different and features many paranormal happenings to rival any other jail. The jail itself was quite successful in the first part of its life but after that became outdated and stopped expanding in size, though the amount of prisoners in the state grew. Overcrowding and poor conditions pushed many of the inmates over the edge and this led to many murders and acts of violence. As for the actual activity that goes on here it would seem that all of the prisons hauntings are residual, meaning that there is no active spirit, but many "recordings" of the events that happened here. These recordings seem to play themselves out over and over again and have been witnessed by many of the guests to the prison who have all made the same claims. The main signs of activity come in the form out sound, with people reporting everything from the normal footsteps and knocking sounds to more worrying things, like pain-filled screams and moans coming from empty closed cells. The hotspot of the prison has to be the executioners chamber. In its life dozens of people were executed here and the area seems to have held on to what they felt before they died. Many people who have come into this area have claimed to have been overcome with intense emotions of sadness or fear, to the point where they have actually burst out crying and had to leave the building.